Our research connects advanced materials with energy systems. We are demonstrating the first-ever use of selective laser melting, a versatile additive manufacturing technique, on semiconductor thermoelectric materials. This approach would enable higher efficiency, cost-effective waste heat recovery devices. Thermoelectric generators (TEGs) offer the potential for effective waste heat recovery in combustion and process heat applications (e.g., engines, heavy machinery, furnaces). However, traditional manufacturing of thermoelectric generators involves assembly and integration processes which lead to performance degradation and high costs. Traditional semiconductor materials processing is largely limited to thin film, micro/nanofabrication techniques such as deposition and photolithography; it is not suitable for large-area processing and components with thick/bulk material form factors. Additive manufacturing generates new, three-dimensional structures which cannot be achieved through traditional manufacturing techniques, but additive manufacturing techniques have only been developed for a limited number of materials, namely polymers and metals. ​Check out an overview of this work here. Inkjet printing has the potential for scalable manufacturing of functional devices like flexible electronics and wireless sensors. We formulate nanoparticle dispersion inks using functional materials and determine the links between ink properties, printing parameters, and droplet behavior. Our investigations include post-processing techniques (e.g., thermal annealing, microwave sintering) and their effect on device performance. Thermoelectric generators can convert waste-heat into electricity, but questions about their cost and scalability remain. We have developed a thermoelectric power generation cost-performance metric (in $/W) which combines material, manufacturing, and system component costs with device efficiency. By applying the metric to thirty state-of-the-art bulk and thin film thermoelectric materials, we quantify the tradeoff between efficiency and cost and find that many bulk thermoelectric materials can achieve costs below $1/W. Nanowires are promising for many energy applications including thermoelectric waste heat recovery, solar cells, and batteries. Zinc oxide nanostructures have generated particular interest due to their optical and electrical properties, ease of synthesis, and non-toxicity. We characterize electrical and thermal properties of solution-synthesized zinc oxide nanowires, including individual nanowires, nanowire junctions, and spray-coated nanowire films. Thermoelectric cogeneration can recover waste heat energy from a variety of combustion systems. There is a need for computationally efficient simulations of practical systems that allow optimization and illustrate the impact of key material and system parameters. This work connects material parameters and system integration. We develop a thermal simulation for a 15kW tankless, methane-fueled water heater with thermoelectric modules embedded within a cross-flow heat exchanger. Realization of effective cogeneration systems hinges on investigating the impact of thermoelectric material parameters coupled with system parameters. 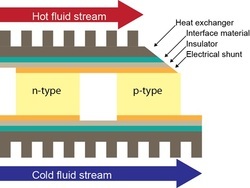 While varying parameters can improve thermoelectric output by over 50%, thermal interface materials can severely limit cogeneration system power output.